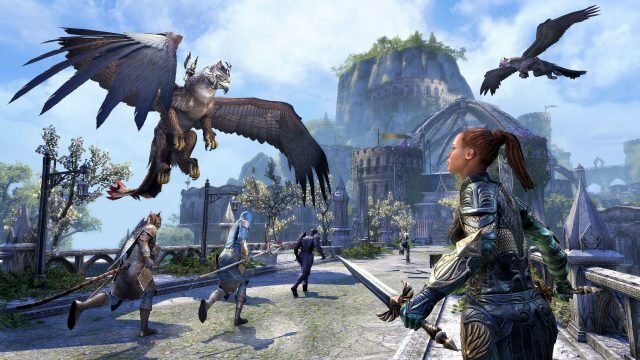 The Summerset Expansion for the Elder Scrolls Online releases today on PC, with the console version coming in just a couple of weeks. In this article we want to explain some of the major changes coming to the game, with this second ESO expansion, as well as fill you in on what’s new. There are some big ones this time around, maybe not a new Class big, but still significant to say the least. Without further ado, let’s get into it! First up on the list is the most obvious, the Summerset zone itself. The Summerset Isles are home to the Altmer (High Elves), and the area is both beautiful and fun to explore. Let’s check out the details of this small, but packed new zone. 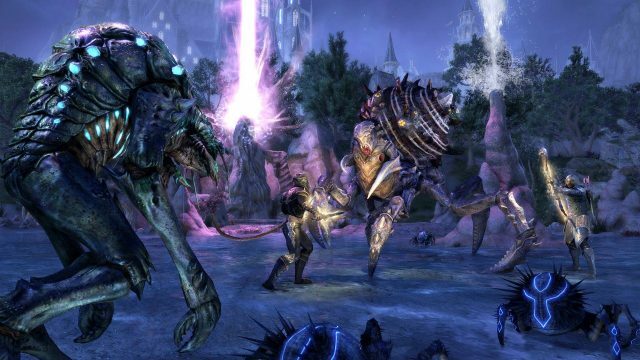 Summerset is a new Chapter in The Elder Scrolls Online, suitable for characters of all levels. This new Chapter includes a brand-new tutorial, zone story content, 6 Delves, 6 World Bosses, and 2 Public Dungeons – Sunhold and Karnwasten. Abyssal Geysers provide a new group challenge, new Item Sets found only in Summerset, detailed below. New Outfit and Housing rewards for completing select achievements and quest content. Accelerate: Bend time and space around you, increasing you movement speed and the power of your Critical Strikes. Undo(Ultimate): Walk backwards through time, reappearing at a prior location with the exact same Health, Magicka and Stamina values from 4 seconds prior. The city of Cloudrest is home to the Aerie of Eton Nir, where an elite force of battlemages are garrisoned alongside their faithful companion gryphons. The Aerie has guarded Summerset since the First Age, but the city of Cloudrest below now lies vacant. The last battlemage, Olorime, has returned only to find the city fallen to some fell power. She was reporting to the Queen on the successful capture of an infamous Sea Sload shadowcaster named Z’Maja. It was so cowed by the Welkynar’s valor that Z’Maja surrendered without a fight when they confronted her. Just like Blacksmithing, Clothier, and Woodworking, you gain Inspiration (crafting experience) in Jewelry Crafting by deconstructing items – in this case, Rings and Necklaces. You gain less Inspiration for deconstructing Jewelry that you yourself crafted, and note that any Rings or Necklaces obtained before Update 18 cannot be deconstructed. These items will have an additional note on their tooltip indicating as much. They can, however, be used for Research, or upgraded with Platings. Jewelry is made with new precious metal materials found in Seams, which are found all over Tamriel in rocky outcroppings, in the shade of cliffsides, or in other stony places – in much the same places you might find the Metals used in Blacksmithing. You can harvest raw jewelry crafting materials (called Dust) from these Seams, regardless of whether or not you own Summerset. Jewelry is improved by using Platings. Platings can be refined from Plating Grains, which can be obtained by refining raw Dust or by deconstructing Jewelry. Traits for Jewelry can be researched by obtaining a Ring or Necklace of the new trait and Researching it. The time required to research a new Trait is the same as other tradeskills – starting at 6 hours for your first trait, and doubling for each successive trait. Just like with other tradeskills, you can research items crafted by other players or those you find in the world. See below for information about how to find Jewelry in all the new Traits for your researching needs. 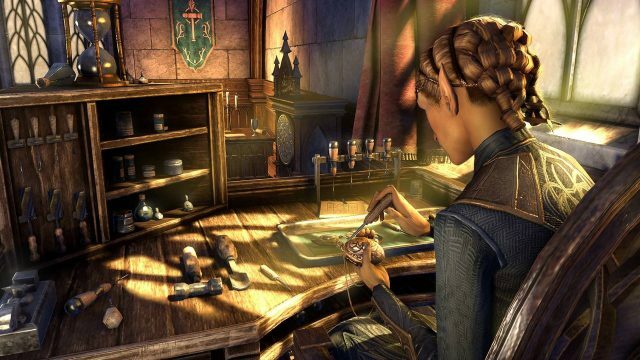 You can craft Jewelry at the Set Crafting areas all around (and beyond) Tamriel. Crafting a Ring or Necklace in a Crafted Set requires Trait knowledge. This is the same number of Traits you need to know for the other tradeskills – for instance, crafting a Hunding’s Rage Ring requires knowing 6 different Traits for Rings. With the introduction of Jewelry Crafting, there are now nine Traits that can be applied to Rings and Necklaces. The six new Traits will not drop on existing item sets or from most sources in the game; rather, jewelry exhibiting each Trait can be acquired by participating in specific activities in the game. (The original three Traits – Arcane, Healthy, and Robust – will continue to appear on the jewelry found throughout the world). Once a trait is researched, you may use any Transmutation Station to change the Trait of your jewelry to that new trait. This costs the same amount of Transmute Crystals (50) as transmuting any other piece of equipment. Beginning in this update, many Crown Store products (with the exception of Houses and Instant Unlocks such as Vampire bites) are now available to gift to other players! When a gift is received, the recipient is notified via the notifications system, and receives a link to take them directly to their gift inventory where they can open the gift. When a gift is sent, the sending player retains a receipt of the transaction within their “Sent Gifts” section of the gift box. All gifts have a 14 day expiration timer, at which point the gift is returned to the gifting player. Beginning on June 5, ESO will be introducing a new rewards system that will allow you to claim a reward each day you log into ESO! Rewards range from in-game currency, consumables, to even unique collectibles. Daily rewards are cumulative, not consecutive. This means you will receive a new reward each day you log in, not based on the amount of consecutive days you log in. Rewards become available to claim at 12AM UTC each day, and the collection of rewards will refresh on the first day of each calendar month. The length of the reward calendars will likely vary in length and won’t necessarily be the same number each month. Until this system launches on June 5, the rewards window UI will appear blank. 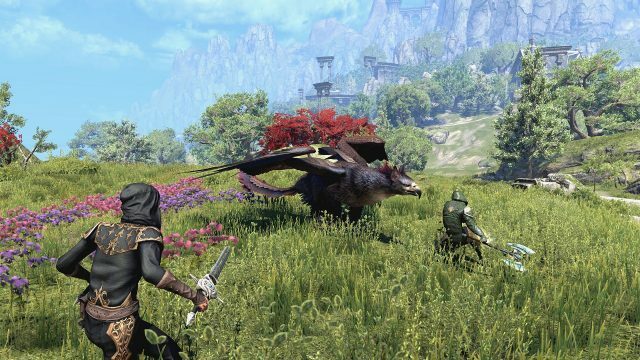 Battlegrounds are now available to all ESO players! We’ve also implemented several improvements for Battlegrounds to go along with this change. Battleground match making now adds an additional multiplier to the value of players who are grouped. This value scales differently between 2, 3, and 4 player groups. This change is intended to improve the quality of matches between players. Pre-formed groups will generally be pitted against pre-formed groups, and solo players will generally be pitted against other solo players. Decreased the rate at which the system expands the range of players to be evaluated for a potential match. These changes were done in an effort to make Battleground matches more competitive. With these adjustments, there may be longer queue times to produce better competition in Battlegrounds, but we will be monitoring their impact and adjusting if necessary. The Activity Finder now includes a Daily reward for completing Random Battlegrounds, as well as bonus XP. You must come in 1st or 2nd place to earn these rewards. Further queuing for the Random Battleground will give bonus XP if you come in 1st or 2nd. You can now choose to queue for specific game types, similar to choosing specific Dungeons in the Dungeon Finder. No bonus rewards are granted for using this queue method, but you are guaranteed to get a game of your choosing when picking Deathmatch, Flag Games or Land Grab games. You can also choose to queue for more than one game type. The Champion Point cap has been raised by a total of 30 points (10 in each red/blue/green constellation) for a total of 750 Champion Points. The Champion Point experience curve has been automatically adjusted with this new cap, so that earlier Champion Points require less experience and can be earned faster. Light Attacks with Two Handed weapons will deal less damage. Heavy Attacks with Destruction Staff and Restoration Staff weapons will deal more damage. Heavy Attacks with Two Handed, One Hand and Shield, Dual Wield, and Bow weapons will deal less damage. This buff category now increases the damage done by your next Light Attack by 40%, instead of increasing the damage done of any attack by 20%. This is a huge nerf to PvP, but will probably come out as a wash in PvE. Two Handed, Bow, Destruction Staff, and Restoration Staff weapons now count for two pieces towards any item set bonus. This is perhaps the largest overall change with this Update and is one that many players are happy about. Those using Staves and Great Swords have been complaining for along time about this, and their day has finally come. I can’t wait to play around with this! Assisting in killing other player characters within a Keep’s area that results in earning AP from that kill. Healing and damaging Keep pieces within the area of a Keep. Resurrecting a player character within a Keep’s area in which the player who was resurrected is located, rather than where the player doing the resurrection is standing. Effective healing (non-self) within a Keep’s area of a player(s) in a battle that would have resulted in AP being granted from a kill. This includes cases where a player is worth 0 or reduced AP from a recent death, such as respawning at a Forward Camp. If a credit is sourced between players that are both in areas associated with an objective, the AP awarded to the pool is split 50/50 between the two objectives. Offensive (Capture) ticks still have a base value that will be granted regardless of being on the credit list, but any bonus AP earned by combat around and inside an objective will only be granted to players that are on the credit lists. You can be on all credit lists for a single Keep Superstructure at the same time (Keep, Mine, Lumbermill and Farm). However, if you attack or defend a new structure (i.e. – a different mine) your credit for the prior structure will be removed. Outposts, Towns and Imperial districts will all overwrite each other in terms of credit lists. Entering a Delve in Cyrodiil wipes your credit from all lists. If your character dies, you will not be cleared from a credit list, but logging out of the game will. Increased the amount of Alliance Points you can earn from a Keep Defense with a multiplier based on the lowest ranking resource level of that Keep. For example, Keeps that have higher ranks in food, ore and wood, will have a higher defense tick for that Keep. For Resources and Outposts, there is a flat rate increase to the AP you can earn on the defense tick. Districts do not have a modifier to defensive AP. Remember, to earn Defensive AP, you must participate in the defense and not simply show up to watch the fight. Drastically reduced the under-population and Underdog evaluation periods. This will result in alliances getting Underdog or under-population bonus scoring adjustments more frequently. While under the benefit of Underdog or under-population, capturing and holding your native objectives will give a bonus towards Campaign Scoring. This should help ensure campaigns remain competitive when one or more factions are outnumbered frequently. Overall this is a massive amount of changes, and I didn’t even get into all the ones pertaining to Skills because this was getting really long already. The changes to two-hand weapons are sure to be put to good use by many players right away, myself included on my Magicka Templar. I’m excited to try out some combinations with dual staves that should be interesting! The new Sets look modestly appealing, primarily because I’m not a Trials player, however if you are that sort then I think you will be very pleased. The new Trial Sets were pretty bad originally on the PTS, but Zenimax corrected that mistake via feedback from the community, which is great! I think the “endgamers” will be very happy. If you found this preview interesting and have already checked out our ESO Guides, take a look at our recent Elder Scrolls Online content: Warden goes to Crown Store, Summerset Sets Preview, 25 Crafted Sets That Need An Overhaul and be sure to visit our Elder Scrolls Online Wiki which covers a number of different topics for all your ESO needs.